Would you like to know how to tap into the world’s most engaged social network? And learn how to build a community of fanatical fans on that network? In this article, you’ll learn how to build a strong following on Instagram. But not just any following. I’ll show you how to build an engaged, loyal Instagram community that has international reach. To guide us, I’ve identified 9 crucial techniques that you can use, supported by real-life examples and the specific actions you should take. Let’s get started with the first. For meaningful engagement, you need to get found and followed by the right people. For this, you need to pinpoint your target audience. The most successful Instagram accounts focus on a specific niche. So, you need to identify the specific niche that you are passionate and knowledgeable about. If you are a Japanese restaurant, ‘food’ or more specifically ‘Japanese food’ might be your niche. Action: Identify a niche relevant to your brand. Then post relevant content on your niche topic. You can’t just post relevant content. You need to post relevant, high quality content that truly resonates with your audience. To do this you need to understand your target audience on Instagram. Who are they? What do they like? What do they hate? What are their aspirations? Observe top accounts in your niche and take notes on what type of content gets the most comments and likes. And what gets zero. Once you start posting content, you can amend your approach depending on the degree of engagement your content receives. Action: Get to know content preferences of target audience, and post accordingly. You can add a lot of value to your post by including informative captions. Travel brands can use captions to tell stories about their destinations. 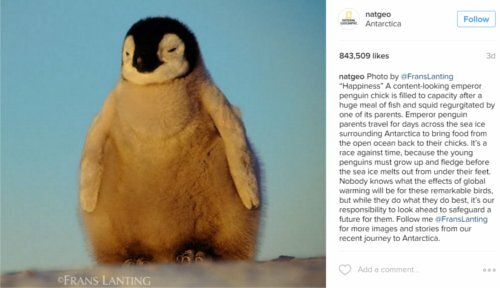 National Geographic uses in-depth captions that provide interesting information that gives context to the beautiful images they share. Food brands, on the other hand, often use captions to show how to create the delicious yet simple dishes displayed in their posts. Action: Engage your audience with informative captions that provide context to the images you share. Use clear call-to-actions in your captions which encourage engagement and motivate action. This is another question that requires you to do some investigation of your audience. This time we are looking at their posting behavior. How often do they post? When are they most active? There are clear differences in behavior between different communities on Instagram. Take the fashion community. Instagrammers interested in fashion use the platform seven days a week, every day of the month. They are most active on Tuesdays, Wednesdays and Thursdays. They are located in key fashion hubs such as London, New York, Istanbul, Jakarta, Moscow, Los Angeles, Sao Paulo and Paris (Instagram). Action: Start by assessing the frequency and timing of posts from top performing accounts in your niche. Then optimize based on performance of your posts. Once you’ve found your ideal fit, post consistently on those days. To stand out on Instagram, you need to showcase a personal style that uniquely defines you photo after photo. How do you do that? Select hues and tones that evoke your brand and resonate with your audience. And continue to display these similar shades throughout your posts. Oh.SoPretty uses black and white with a pop of color to bring a modern, artistic look to her posts on Instagram. Top tip: Use the edit tool on Instagram to tweak the warmth, saturation and color of your photos. Such precise editing enables you to deliver style consistency across your posts. You could also use the same filter consistently to distinguish your brand. Your brand personality also comes through in the words that you use. 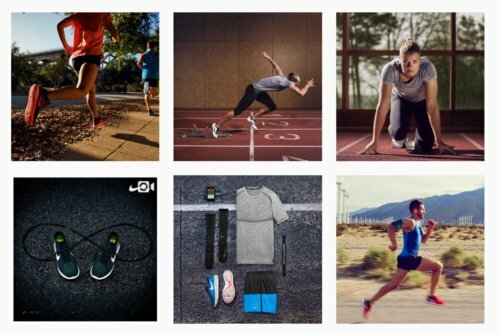 Use a unique brand voice in your captions that provide inspiration and motivation to your followers. Further display your brand personality in your captions and any audio. In your video posts, remind your employees to ‘stay on brand’ as they act as the face of the company (Social Media Examiner). Action: Identify a unique personal style that you consistently follow in your posts. Establish a distinctive image style and brand voice to achieve this. 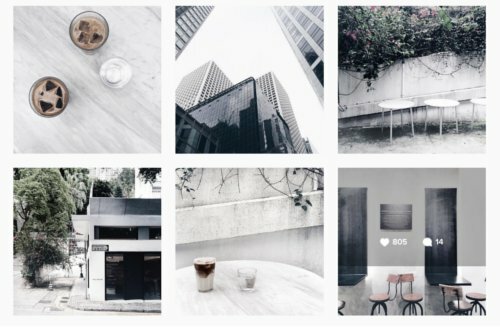 How can create Instagram posts that intrigue and excite? Showing real-life content, such as a behind the scenes look at your company, is a good way to captivate your audience. Burberry uses Instagram Stories to share behind the scenes photos in the run up to fashion shows. This enables the brand to establish a more personal connection with their followers. It also creates drama and intrigue as the information only lasts 24 hours (The Global Marketing Alliance). Action: Use Instagram Stories to present the real, less polished side of your brand. To build an engaged Instagram community, you need to get personal with your followers and fans. This is social media after all. So, ask interesting questions and respond to any thoughtful comments that you receive. Also engage with content on other people’s accounts. Pay particular attention to accounts that have followers that you want to attract to your page. Leaving helpful comments will intrigue others to find out what else you have to say. You might even get a new follower if they like your page. People love to hear their voice heard. So, take audience engagement to the next level by featuring user-generated content. Yoga and activewear brand Lululemon did this in their highly successful #thesweatlife campaign. They asked users to post pictures of themselves exercising in Lululemon using the #thesweatlife hashtag in their submission. Building off the brand lifestyle of ‘being active’, they built an emotional connection with their active followers (Yotpo). Action: Create conversations with other users by asking questions and responding to comments on your posts. Also comment on quality images posted by your fans on their own accounts. Remember to give recognition to brand advocates by featuring user-generated content on your Instagram page. Partnering up with an Instagram influencer is an effective way to gain the attention of your target audience and gain meaningful audience engagement (Mediakit). Their followers also trust their opinion and recommendation of relevant products and services. The key is to select influencers that are compatible with you brand. Here’s an example of how it works. Instagram is a popular social media network amongst travelers inspired by beautiful locations. 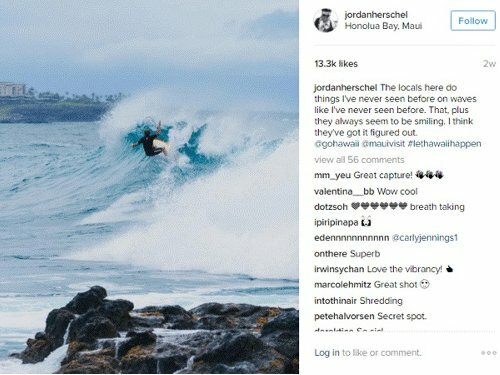 With that in mind, the Hawaiian Tourism Authority collaborated with top Instagrammer Jordan Hershel, who’s visited some of the world’s most scenic locations. His beautiful images of Hawaii enabled the brand to reach 54% of travelers across the U.S. 65% of users who saw the campaign intend to visit Hawaii within the next two years (Social Media Examiner). Action: Partner with influencers that are relevant to your brand. Learn how to find, connect and leverage local influencers by reading this post. 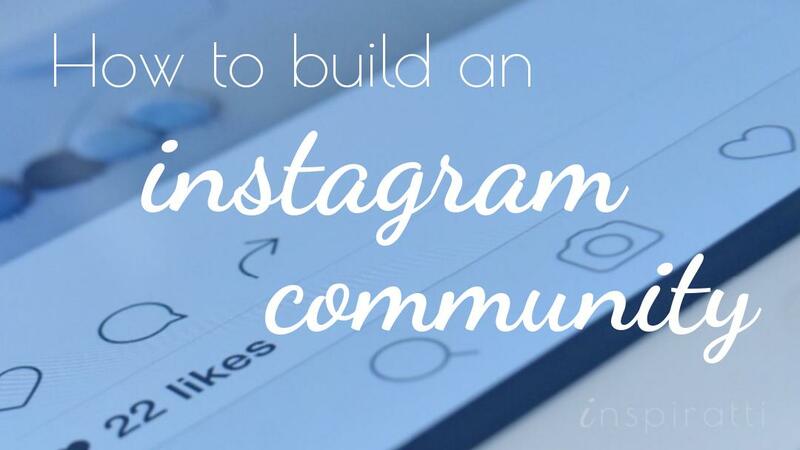 Why do you want to build a community on Instagram? Is it to drive traffic to a paid community on your site, or to raise awareness of a related product you offer? Identify your goal in using Instagram. Each time you make a post, consider how that post contributes to that reaching that goal. If you want to drive traffic to your paid community, you need to demonstrate the value you offer by posting interesting and useful content that meets the needs of the specific community. Whilst you should identify a goal, sales objectives should not be overt in your posts. Instead, use your posts to create an experience and emotional connection with your audience. Over time, you will build the trust and community you need to realize your ultimate goal of making a sale. Focus, therefore, on using call-to-actions to encourage interaction and engagement with your posts. When you do use call-to-actions for lead generation, ensure your call-to-actions are benefit-orientated. For example, ask “do you have this problem?” rather than “buy this”. You could include a call-to-action in your Instagram bio. Call attention to an attractive opt-in incentive, such as a free eBook that addresses a common challenge encountered by your target audience. Then, ensure a smooth customer journey by setting up a dedicated landing page targeted to the specific needs of your Instagram followers. Having their email will enable you to interact with users in new ways outside of the Instagram platform. Action: Identify your goal in using Instagram, and feed this into the content you produce on network. Pave the way for a sale by setting up a customer journey that drives users to other channels where they can connect with you. Just building a following on Instagram is not enough to be successful on the network. You need to build an engaged and loyal following. For that, you need to post unique, original and captivating photos that provide inspiration and value. The photos are key. But don’t ignore the captions. They are a great outlet for personal interaction and feedback. Following the guidance in this post will set you on the path to creating high engagement and strong loyalty. So, go forward and create your Instagram community. Inspire, be inspired and create amazing experiences. Then let me know how you get on in the comments. p.s. 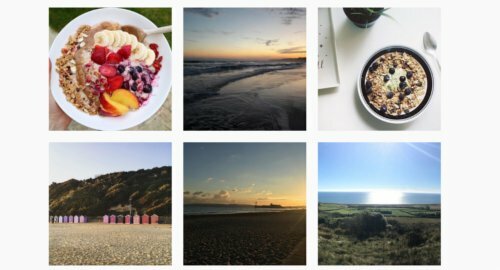 If you are still not sure ‘if’ and ‘how’ to get started on Instagram, check out my other article. I cover whether investing in Instagram is right for your brand and how to get international reach on the network.